Lock in a great price for Château de Bagnols – rated 9.1 by recent guests! We are seasoned travelers and this is our favorite hotel in all the world. The 800 year old Château is its own adventure; every room a masterpiece. The fireplace in the main dining room is said to be the largest in France and was built for one of the popes of the Middle Ages in anticipation of his visit. Chateau Bagnols has 3 eating venues and all are excellent. You won’t want to leave....it’s heaven on earth. The history and design of the property is devine. Central courtyard is stunning. Views are stunning. Grounds are stunning. Chef made us a special meal that was outstanding. Many nice touches added to the ambience of this refurbished chateau. Incredible example of Architectural conservation and combining with 5 star accommodation and Excellence in Catering . The views and the comfort are unique as well as the fast and easy access from main city . the location is fabulous and the dinng experience was wonderful. We have stayed many times at Chateau Bagnols, the bedrooms in the Courtyard building are well appointed in a wonderful medieval setting. The meals were absolutely exceptional. It is a true pleasure to take a drink on the terrace and enjoy the surrounding beautiful Beaujolais countryside. This is the real deal, an actual castle with proper castle rooms. It's not one of those hotels where you check in at the castle and then get taken out to a modern block behind. The rooms were huge and very individual. The food in the restaurant was incredible and the staff were very efficient if not overly friendly. The place itself is incredible and you can easily spend all afternoon just wandering round the grounds imagining you are a Knight or nobleman. A real experience all round. The castle suites are everything you imagine. If you can drag yourself out of them for dinner book a table in the hotel restaurant and don’t hesitate on letting the staff recommend the wine - although expensive at this level of serivices I thought the prices were actually very reasonable. Located in the heart of the Beaujolais, Château de Bagnols is an historical monument with over eight centuries of history, as well as a prestigious hotel-restaurant. Its moats, surrounding walls, towers and golden stones are surrounded by vines and set amid French style gardens. Each room and suite at Château de Bagnols has an individual and refined décor. Rooms and suites are furnished with restored antiques and mural paintings. For a unique candle-lit dinner, guests can dine in front of one of the largest gothic chimneys in Europe in the fine-dining restaurant. The restaurant offers guests traditional local cuisine with a contemporary twist, inspired by the quality and abundance of the produce of our local markets. Guests have free access to the property's spa with an indoor swimming pool, a hammam, a fitness room. Massages and a nail corner are available for an additional cost. In summer, they can also enjoy Roman outdoor swimming pool. Guests can contact the concierge to arrange activities such as skiing, horse riding, and hot-air balloon trips. Château de Bagnols is 20 mi from Lyon. This property also has one of the top-rated locations in Bagnols! Guests are happier about it compared to other properties in the area. 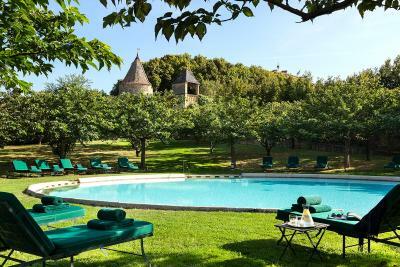 When would you like to stay at Château de Bagnols? This room is in the chateau or in an outhouse. It features antique furniture, an Italian marble bathroom and a ceiling that is either vaulted or has exposed beams. It also has terracotta floor tiles. This suite features a private, marble bathroom and a view of the surrounding hills or the courtyard. This duplex apartment features antique furniture, a fireplace and a private terrace. It also has a dining room, lounge and a view of the valley and garden. This suite features a separate lounge or a seating area, and a view of the valley or the courtyard. This double room features a cable TV, DVD player and bathrobe. This double room has a DVD player, cable TV and bathrobe. House Rules Château de Bagnols takes special requests – add in the next step! Château de Bagnols accepts these cards and reserves the right to temporarily hold an amount prior to arrival. Please note that it is possible to have lunch or dinner at the on-site gastronomic restaurant upon prior reservation. For bookings of 4 rooms and more, special conditions my apply. For more information, please contact the property directly. Restaurant food was good but service was appallingly inefficient at both dinner and breakfast. More wait staff definitely needed. Not a criticism but a reality the bathroom plumbing a little non performing but a very small prize to pay to get such and authentic space . Yes, it's a chateau but a room with no windows only a door to the outside which if left open at night is a security risk and if closed leaves one in a windowless box. The only way to cool this box is with a huge fan the size of a washing machine and the noise of a large truck. Sleepless night. Eagerly looking forward to breakfast we were startled to find that tables were still being setup 15 minutes after advertised opening time and the chef was still stocking the buffet table thirty minutes later! Surely a firing offense? Pool furniture shabby and antiquated. Castles are old and they don't have aircon or particularly good plumbing. The shower was really bad and the rooms very warm even with the huge windows open. Usually this is something that really worries me, but this place is so authentic that sweating at night simply added to the reality of being in a castle and therefore it was fine. When we arrived at three the room wasn't ready at 3.00 but it was a four o clock check in but at 4.30 pm the room still wasn't ready 10 minutes blaster it was after a 300 mile drive this is not on also they took us to our garden suite which did not have aircon the room was like a oven. It was 96 degrees . when I complained they found a room with aircon. This is supposed to be a 5 star hotel the rooms have to have aircon or at least tell you they haven't. The WiFi did not work either . The breakfast which is not very good is left outside in a sort of open area with flys all over it . I spoke to management they seemed dis interested they were going to tell the chateaux owner rather than dealing with the problems themselves . No separate shower. Shower over roll top bath meant an inevitable wet bathroom floor. Insufficient staff in dining room for a Michelin restaurant. A wedding was taking place which meant staff diverted to it instead. We had to wait 45 minutes before being shown to our table and 3 waiters served 18 tables. Unfair on them as they were totally stretched. Too many wines on a fairly shortish wine list were unavailable. Stunning room in converted barn but too hot as no air conditioning. Amazing location with wonderful views over Beaujolais. It is magnificent in a great location outside Lyon.